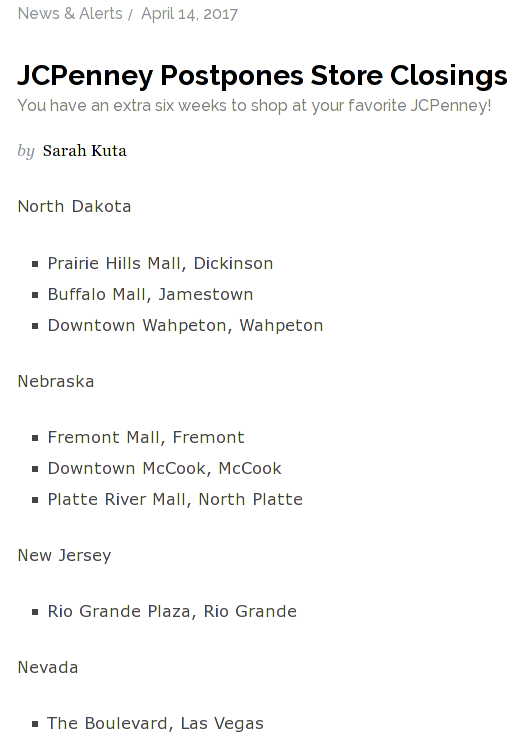 Why is Nebraska listed after other states? I have also seen this elsewhere when you have a drop-down list to select a state. My guess is this: the table was produced from a database. The data there was sorted by state, but using a stored value that was the state abbreviation (they would have used the US Postal Service's official state abbreviations). The actual state name was then assigned via a lookup at the time the report was generated. Databases are broken into subject matter tables to avoiding duplication. The tables serve as the single place where each element is stored. This minimizes space and simplifies data maintenance. The tables are then linked to each other. The report you cite lists Store Name and City, grouped under State Name. It probably came from a database that had Store information in one table, possibly city information in another table, and state information in still another. State names are various lengths, so they make a poor unique value to use for linking the information in the State table to other tables. That linking value needs to be as short as possible and a standard length. The state abbreviation is perfect for that, it's always exactly two characters. The state name was likely a field in the State table. In your report, the store listings are alphabetical by city name, so it is likely that one of the tables used for the report contained the city name and state abbreviation. The person who created the report sorted everything based on that table and then used the state abbreviation to look up the state name for the report. Not the answer you're looking for? Browse other questions tagged names sort-ordering or ask your own question. Why is there a “riding” in “Little Red Riding Hood”? Why is the letter J so common in names of people who go by their initials? Is Father Christmas unwelcome in the United States? Why are names that begin with 'Mc' first in order over names that begin with 'Ma'? Why is there an 'a' at the end of “Crimea”?